Heir to the Jedi is part of the “new canon” for the Star Wars universe, meaning that whatever you read here is now and forever (or until they change their minds) officially part of the grand Star Wars story. I’m not sure why there needs to be an ‘official’ declaration of this other than that a few savvy readers would otherwise question (at conventions and online) each adventure and wonder “Did Luke really do that?” (as if Luke Skywalker were real and some adventures are true, and others not). For myself, I just like a good story, and if contains characters with whom I am already familiar, then I typically find it very comforting. This story, by Kevin Hearne, features Luke Skywalker and R2D2 (and not much of the other main characters from the movies), and takes place shortly after A New Hope. Luke is not yet a Jedi, but still a moisture farm boy who is just beginning to experience a taste of the greater galaxy. Hearne does a good job of reminding the reader of this throughout, with Luke trying to use the Force with very little success periodically. The story is that Luke is sent on a mission for the Rebel Alliance. He is rescue a brilliant cryptographer who is trying to defect from the Empire. She is not a hostage, but she is being monitored due to her uncanny abilities to decode even the most advanced codes and communications systems. But getting in and out of Empire territory will challenge Luke and he’ll need more than a fast ship to pilot. For the most part, Luke travels a lot, hopping from planet to planet and I’m not sure why this was important. I found no reason for it. The plot is very straight forward and basic. Rescue the brilliant cryptographer. There is a new character introduced into the canon — Nakari Kelen — to help him along the way. If you’re looking for a deep story with exciting subplots, this isn’t the book for you. The plot is just what I’ve mentioned above. Why would he ever say “What? You said there was no such person.”? Did he suddenly forget that this was supposed to be a secret? Flirting on a mission is one of the best ways to ensure mission failure—and most likely romantic failure. I’d seen Han Solo get in trouble too many times while he was trying to charm Leia to doubt it, and he hadn’t exactly won her good graces yet. When, exactly, did Luke see Han trying to charm Leia … too many times? I found Hearne’s choice of perspective an interesting one. This book is written in first person, from Luke’s point of view – which explains part of the reason there isn’t any subplot … we can’t visit any other players unless Luke is there. Typically these sorts of books are written in third person, and I found the POV refreshing, even if it did narrow down the scope of what could be told. I don’t care if this is ‘officially’ part of the Star Wars mythos story or not. I found it to be a generally interesting read, though it won’t have a lot of lasting value. Looking for a good book? 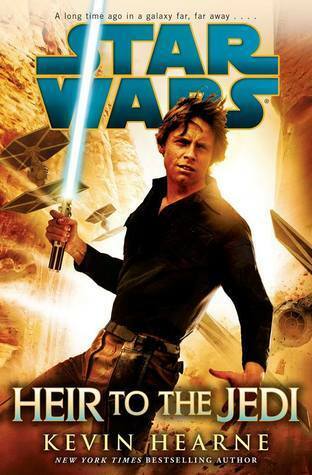 Heir to the Jedi, by Kevin Hearne is a quick story of a Luke Skywalker adventure that takes place between the events of Star Wars movies, Episodes IV and V, and is a fine enough story but lacks any new information relevant to the movie history.